The Rosewill RC-508 is a PCI Express to USB add-on card. 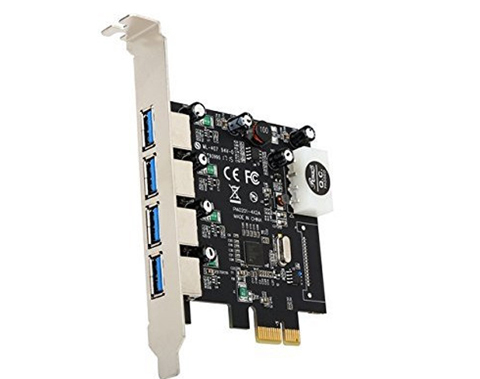 It easily connects to a motherboard via PCI Express (X1) interface to add four USB 3.0 downstream ports to your PC instantly. This means you can effortlessly connect multiple USB devices to your PC. The USB 3.0 ports support different data transfer rates – including low-speed (1.5Mbps), full-speed (12Mbps), high-speed (480Mbps), and super-speed (5Gbps). The hot-swapping feature allows you to connect/disconnect devices without powering down the system. The built-in 4-pin power connector allows for receiving extra power supply from system.